Complex instrumentals lined with danceable new form funk. Jimmy Thomas (Electromass) started from the UK Bigbeat scene gathering many styles and ideals which have now set him up to master the art of darker edged dubstep and experimental instumentals. His interest in the mechanics of electronic music began early -- writing drum patterns in all styles and gaining knowledge from profressional drummers in the scene who have helped him develop his sound since his early years. 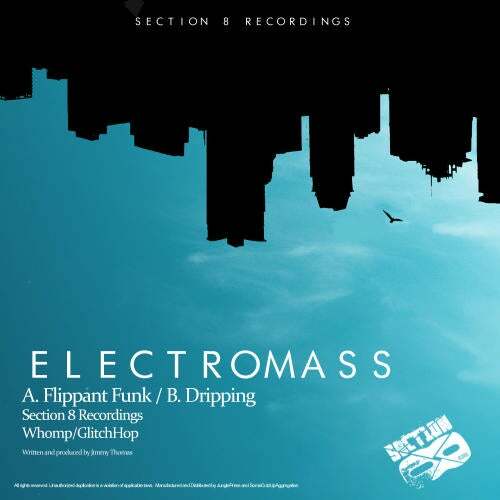 His newest single, "Flippant Funk" is a de-emphasis on melody but empasis on strong rhythmic grooves and electric bass, An admixture of influences including drummer Bernard Perdie, and musicians such as early Chemical Brothers and Amon Tobin. This particular release in fact has an Amon Tobin-esque experimental breaks feel to it ... yet you also get a sense of deep hiphop rooted drum breaks and sampled jazz funk compositions of various natures,.. Both tracks focus around the half-time 90BPM shuffle and are very mixable with drum and bass and hiphop.. either way a definite good way to "funk up" a mix when you need to. Recommended. BIO FOR: ElectroMass Early in life I had a general disinterest in music, but everything changed when I was 16 after hearing a tape of my dads. The said tape was The Chemical Brothers first album, Exit Planet Dust. From that point I had a huge interest in the mechanics of electronic music and wanted to experience it for myself. I learned how to sequence on a free program I downloaded called Dee Sampler, from the ages of 16 to 18 I just wrote drum patterns in all styles, gaining knowledge from a close friend that drummed for a living and irritated my parents no end. My fascination for music production and thirst to learn more put me on the path to a BTEC in Music Technology. A few months into my course, a lecturer introduced Ableton Live 5, completely overwhelmed by its power and flexibility, Dee Sampler was left for dust. My taste in music at this point had changed somewhat buying Drum and Bass vinyls with any spare money and listening to Amon Tobin in the same obsessive fashion as I did The Chemical Brothers. From this I listened to and sampled jazz creating compositions of that nature, but used the facilities of my college course to record my friend playing drums and found sound wherever possible. Bernard Perdie was a great inspiration for my friend and I, creating drum and bass tracks which always featured half-time shuffles. My first break, if not for a better word, spawned from my sampled jazz compositions getting a tracked signed on a US label and having a couple more after that. That said it was not where my heart lay, but in production focusing my attention to Drum and Bass. My songs included more half-time sections then full time which coincided with the rise of Dubstep so complete half-time compositions took full effect. College progressed to a Creative Music Technology Hons. which I'm in my third year of study with my production in Dubstep gathering more and more pace. I brought a lot of equipment to aid my production and live performance doing a couple of gigs and house parties in the last year. Live shows are where I'm focusing my attention with my FYP based on writing a program for a Visual Audio application to partner my live performances, building up fans on Soundcloud and forums, gathering followers one day at a time that will hopefully hear and see my work and become as obsessed as I am.